When ideas go too far. Can ideas become too powerful? Can they become so far travelelled, so tested, that they withstand any assault, be it from reason and truth even? That was surely the goal and promise of the first idea theorists, the Greek sophists. Notoriously summed up in the statement by Gorgias that he could win any argument -- right or wrong. 2500 years later, humanity is battling an idea with powers that Gorgias would have tipped his hat to. This idea, too, has been captured in a perfect statement. Only this time not on some wrinkled parchment, but on 35mm celluloid. “Plastics!” Mr. McGuire probably focused on the most powerful idea of the last 50 years. It has created industries. It has given us a million shiny objects. It has changed our life. But that is nothing compared to what plastic is about to become: nature itself. Plastic does not biodegrade. All the plastic we make and discard will remain plastic until Wall-E come. But, this does not mean that plastic does not break apart. And that these pieces will not fly and float to far away places. In large parts of the Pacific Ocean, small and microscopic particles of plastic trash now outnumber plankton six to one. Animals who look for tiny specks of life in the ocean are now more likely to swallow plastic than an organism. Evolution has always had a hard time keeping up with human imagination. Usually it loses the race, because evolution works in generations. When it is successful, it happens mostly where we don’t like it. Bacteria and viruses adapting to our “cures” are among nature’s success stories. Sometimes we help by speeding up the evolutionary principle of mutation -- seen this way, the two-headed cows born near Chernobyl were at least trying. But the fish and the seabirds are not. Ocean life in the “Great Pacific Garbage Patch” is buckling under an unholy trinity: 1. The various form of deconstructed plastic that look like food but have no nutritional value. 2. Things that cannot decay and cannot be digested slowly fill up digestive tracts, leaving no place for real food, causing starvation by a full belly. 3. The plastic particles are so good at binding poisenous chemicals that they become little poison pellets, bringing old friends like DDT or PCB back into the food cycle, their concentration being up to 1 million times higher than in the surrounding seawater. In a true overkill, ocean life is choked, starved, and poisoned to death at the same time. Unless of course, we catch it and eat it first. It seems obvious that idea of plastic everywhere for everything has to be discredited. But how? Who can do it? Charles Moore could, and did. Charles Moore is a sailboat captain and during a race in 1997, he realized that even in the middle of the northern Pacific, tousands of miles away from the US coast, the waters were still full of plastic trash. Of course, it was not the big media who broke his story. It was YouTube who gave Moore’s ideas and insights worldwide reach. It was people like you and me who forwarded the links to the videos, and made their own ones. Almost a hundredthousand were reached like that. And it was the idea conference TED who -- by hosting Moore in 2008 -- gave him enough media nobility to finally cross over into the mainstream. Now that significant attention had been directed to the problem, the ABCs and BBCs started to cover it. The topic is too abstract to be in the mass media for long. The middle of the Pacific ist out of sight and not on any political party’s agenda. But with the help of broadcast coverage, attention reached critical mass in the spring of 2009, and the YouTube views took off: reaching millions. So it took 12 years from Charles’ lonely discovery to being a frequent facebook link. Considering that his idea is up against one of the core beliefs of our industrial system… is this slow? Or fast? Now, artists are helping to biodegrade the idea of plastic as The One. 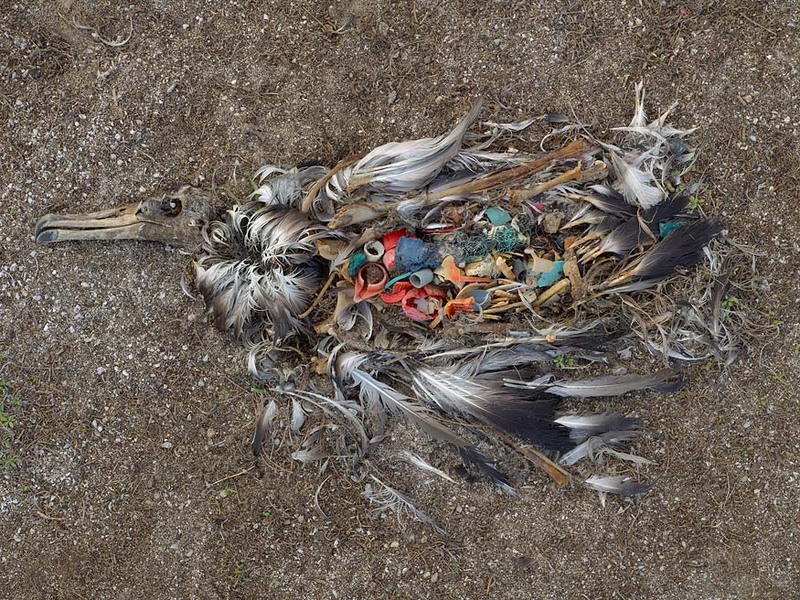 The photographer Chris Jordan (thanks for the link, Lina) has taken a trip to the pacific gyre, and has brought back harrowing pictures of some of the tens of thousand albatros chicks who are fed to death with plastic from the sea. On September 19th, the documentary film Plastic Planet was released. The austrian filmmaker Werner Boote follows the polyethylene terephthalates, polycarbonates and bisphenoles, and while he is no Michael Moore, he paints a disturbing picture of how these non-degradeable substances have already entered our body, our blood. How we have become -- partly plastic. And what it is doing to us. This is no longer the great future Mr. McGuire envisioned in “The Graduate”. We’ve all lived it for a while. But it’s time we spread the news that this idea has gone too far. PS: On a recent trip through the Senegalese countryside, I saw plastic shopping bags everywhere: flying across fields, stuck in thorny bushes, and even ploughed halfway into the ground -- by an ox and a man in a traditional boubou. Have you seen Addicted to Plastic by Ian Connacher? Another documentary in which the horrifying reality of plastic pollution is revealed. Next on my list to see.